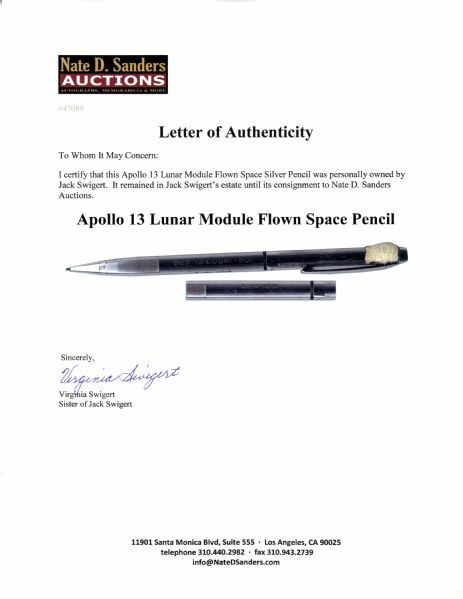 Apollo 13 Lunar Module flown space pencil personally owned by Command Module Pilot Jack Swigert. The crew endured incredible circumstances after launching 11 April 1970, when two days later, they were forced into an emergency turn-around before ever reaching the moon. Fortunately the astronauts expertly improvised a repair to the spacecraft and narrowly escaped disaster, ultimately returning safely to Earth. Silver mechanical pencil still works and has original graphite intact. With ''SEB 12100081-301'' and ''S/N 2015'' engraved in black to side of pen. Measures 5'' with tiny piece of velcro taped to top. Near fine. With an LOA from Swigert's sister.